A new 24 MW biomass-based power plant in Arizona-the largest renewable energy facility in the state-is using wood waste from area forests and unusable recycled paper fibre from a local paper mill to produce green power for thousands of homes. 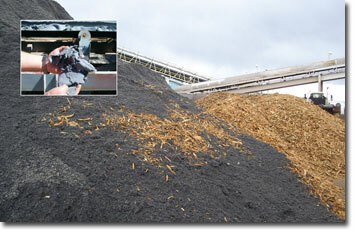 About 75 percent of the fuel for the Snowflake White Mountain biomass plant comes from residual forest biomass (above) with the remaining 25 percent of fuel being unusable, recycled paper fibers (above, inset photo) discarded by a paper mill. The founder of an Arizona-based green energy development company believes that biomass will be the workhorse of the alternative energy industry-and he is backing up that belief with a substantial investment in biomass-based power generation. "I support wind and solar power, but I believe there is a lot of wood out there and it's there whenever we want it," said Bob Worsley, the founder of Renegy Holdings Inc., at the recent opening of the $70 million Snowflake White Mountain, 24 megawatt biomass power plant. The Snowflake White Mountain plant is the largest renewable energy facility in Arizona, a state that has set a goal of generating 15 percent of its electric power from alternative energy by 2025. In addition to generating green power, the plant is also helping to clear the air as it will consume a lot of forest slash that would traditionally have been piled and burned. "That would have sent all the pollutants into the atmosphere," says Scott Higginson, Renegy Senior Vice President. "By capturing those slash piles, grinding them, and bringing that material into the biomass plant, we are able to reduce the emissions from burning the wood by 98 percent." Worsley, a businessman who started his career as an accountant with PriceWaterhouse before founding SkyMall Inc. in 1989, latched onto the idea of using wood biomass to generate power after witnessing the devastation wrought by the Rodeo-Chediski wildfire. That fire, the worst wildfire in Arizona history, lasted about three weeks in the summer of 2002 and destroyed 467,000 acres of woodland and about 400 homes. Worsley witnessed the disaster first-hand, seeing the fire burning from his home. But beyond the fire's enormous destruction, he saw a business opportunity. He was disgusted by what he saw-a substantial fuel resource going up in smoke, when it could have been harvested and put to use. Thus the idea for the Snowflake White Mountain biomass power plant was born. What breathed further life into the concept was passage of the federal Healthy Forest Initiative in 2003, largely as a result of the Rodeo-Chediski wildfire. That federal law is designed to help protect forest lands against catastrophic fires by focusing on responsible cleaning of dense undergrowth and brush in crucial areas adjacent to private homes and property. What it represented to Worsley and other investors was the potential for a reliable, long term fuel source for a biomass energy project. While Arizona is often associated with desert, the northern third of the state is home to the largest stand of Ponderosa pine in the United States. Logging is an important chapter in the state's history, but according to Renegy's Scott Higginson, industry activity has fallen off lately, leading to an unhealthy situation in the forest, resulting in greater potential for wildfires. The Snowflake White Mountain biomass plant began producing power in the spring of 2008, with 75 percent of its fuel source coming from residual forest biomass, largely from U.S. forestlands surrounding the communities of Arizona's White Mountains. The source of the remaining 25 percent in fuel is coming from unusable, recycled paper fibres discarded by a Catalyst Paper Corp. mill. The mill produces about 250 bone dry tons of unusable paper fibre each day. Paper can only be recycled seven times before it must be discarded, and this material was being landfilled before the opportunity to use it to generate power became available. The paper mill's previous owner, AbitibiBowater, played a major role in the Renegy power plant's location on the paper mill site, as it had space available for both the power plant and fuel storage. The change in the site for the power plant from the community of Snowflake to the paper mill also created the potential to expand the plant's output from 10 megawatts to 24 megawatts-enough to supply power to 9000 Arizona homes. Public Service, and the Phoenix-based Salt River Project which is the largest provider of power and water to the greater Phoenix metropolitan area. This biomass project is Renegy's first, and is only the beginning, according to Worsley. The company also owns a mothballed biomass power plant in Susanville, California, which it purchased in November 2007 with the intention of refurbishing it for re-commissioning. The air permitting process for the plant is currently underway. Worsley has also expressed an interest in building other biomass-based power plants in Flagstaff or Camp Verde and another plant in the Phoenix or Casa Grande area. However, Renegy president and chief operating officer Hugh Smith says the economic climate has put the company's plans into a holding pattern. "We are kind of treading water at this point in time," he says. "Our expansion plans were based on our ability to go out into the capital markets and raise funds for this type of expansion. It shouldn't be a secret to anyone, with the advent of what's occurred in the financial markets, that it has not been a very easy path over the past few months to raise capital." So far, the company has announced letters of intent to acquire additional properties and is doing its best to try to raise funds to proceed. While the Snowflake White Mountain biomass plant is Renegy's first foray into green energy, the company was actually well positioned to make a move into biomass-based energy because of its roots and experience in the area's forest industry. The company had produced lumber and shavings, and played a major role salvaging logs from the Rodeo-Chediski fire. Now the company is primarily focused on producing shavings for horse bedding and biomass for the power plant. Renegy does a lot of contract work under the Healthy Forest Initiative. It currently has 24 contracts with the U.S. Forest Service and also does work under the White Mountain Stewardship Contract to retrieve material. Whatever can be salvaged by the company for shavings is used in that way. However, this harvesting and manufacturing activity also generates a lot of limbs and unmerchantable wood, and this becomes fuel for the biomass power plant. Grinders process forest slash material to between one and three inches in diameterin the woods, and semi-trailer trucks transport the material to the biomass plant. 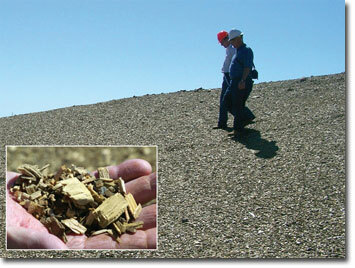 The plant receives 22 to 24 truckloads of forest material every day, which is added to a large stockpile (right). The company uses a horizontal grinder and a tub grinder to process the forest slash in the woods, and augers the fuel directly to semi-trailer trucks that transport the material to the biomass plant. A truck dump lifts each truck to a 60 degree angle to unload the material, which is then conveyed into plant fuel inventory. The plant receives 22 to 24 truckloads of material every day. With a plant of this magnitude, Renegy stockpiled fuel for a couple of years before the company threw the switch on the power plant. The burner consumes a mixture of both new fuel in short term storage and older fuel from the established inventory, but the two year stockpile is constantly maintained. "We also have about four green waste sites on the mountain where residents of the communities can bring in their green waste from the trimmings they do on their own trees and other plant material from their homes," says Higginson. "We will go into the waste sites periodically as they fill up and will grind that material, and haul it to the plant." Renegy has also partnered with other sawmills and with Phoenix as part of its urban wood waste program to gather more wood biomass fuel. For the bubbling fluidized bed burner to operate efficiently, Renegy grinds the material to between one and three inches in diameter. Moisture content is also a concern. "The bubbling fluidized bed burner is specifically designed to be able to handle higher moisture fuels than most other types," says Smith. "The boiler easily handles fuels with up to 50 percent moisture content and most of the fuel that we have falls well within that specification." For the economics to work to Renegy's satisfaction, the company has set a radius of 50 to 75 miles from the power plant for the acquisition of fuel, factoring in the cost of transporting a grinder to the location and diesel fuel to truck the material to the plant. The unusable recycled paper fibre is processed through a screw press to reduce its moisture content down to 50 per cent from 75 percent, before it is introduced to the boiler. Higginson says their utility customers appreciate the green power that the Renegy plant can provide because of its reliability. While Arizona is often associated with desert, the northern third of the state is home to the largest stand of Ponderosa pine in the United States. Harvesting and manufacturing activities generate a lot of limbs and unmerchantable wood, and this becomes fuel for the biomass power plant. "We don't have to have the sun shining or the wind blowing to produce electrical power," he says. "So we can go onto their base load calculations and they're able to count those megawatts 24/7." The power market is expected to remain strong in Arizona. "As far as demand, Arizona is constantly in a seesaw battle with Nevada for the title of being the fastest growing state," says Higginson. "So a decline in the need for additional electrical power sources is not something that's seen in the future for Arizona." Hugh Smith says the recent drop in fossil fuel prices has actually helped the power plant's bottom line as it has had a positive impact on the cost of transporting and processing of the biofuel. In terms of competitiveness, biomass is competing primarily with other alternative energy technologies and not with fossil fuel-based utilities, as states like Arizona adopt renewable portfolio standards requiring that a portion of its energy portfolio comes from renewable sources.